The problem was a burnt contact on the circuit board. In this video we show you how to replace the control board. Where can we purchase a new circuit board? LouAnne – I got mine from a local parts store. Check the yellow pages. You could bring in the old board with you and they can match it up. Fantastic post – helped me fix the same issue on my 6 year old fridge. Thanks much, guys. Thanks for this video! I was about to call a repair man and you saved us the $! We were having a similar problem, so I ordered a new circuit board from amazon and it fixed our issue! What a great feeling. We are not even do yourself type people. You made us handy! Thank you. Just ordered ‘Whirlpool W10135090 Defrost Control for Refrigerator’ by Whirlpool for $93 from Amazon. Supposedly Whirlpool replaced Part # 2252189 (which is the Elec. Control part # from my refrigerators manual downloaded here – http://www.whirlpool.com/manuals – model # is on the plaque inside the refrigerator) with Part # W10135090. I’ll follow up when I’ve got the part to confirm that it worked. Follow up – “Whirlpool W10135090 Defrost Control for Refrigerator” by Whirlpool for $93 from Amazon worked great and it was indeed about a 10 minute job! Thanks Handyguys! Thank you so much. It worked perfectly and I didn’t need my husband to lift a finger because you guys made it so easy for even a girl like myself to follow. What a wonderful discovery !!!!! You guys did a fantastic job of saving a lot of people money – not to mention the fear of being ripped off. I had never heard of The Handy Guys Podcast but after seeing this video, I will come to your site often for any repair that I might encounter. Can’t wait to get my fridge fixed. GREAT JOB GUYS !!! and Thank You for being a service to your fellow DIYer’s ! Handy Guys – YOU ROCK! I am a 60 yr old female who lives and works alone. The light went out in the fridge, simple bulb problem? NOT! Had a repair guy come in and bottom line was if I used their service the whole job would have run me $450. to fix with a $289. part. I went on-line & got the part for $89. and with the repair guy coming back to install it would have been a total of about $250. Then I found YOU GUYS. And your video was so easy I said what do I have to lose, lets go for it & I DID IT! I can’t thank you enough a $450. bill ended up $130. Keep the tips coming! Thanks for the info, I bought part and installed it for less than 70 bucks. You guys ROCK! Im hoping replacing the circuit board helps and something isn’t causing that part to short. I appreciate the fact you showed us in a clear video! Thanks so much! These Whirlpool Gold side by sides have had problems after problems. This is sad that as a consumer there is a faulty bored yet we are the ones having to pay more money out of pocket. Thanks again for the help! From the comments it sounds like the video described is the problem I have, however the video associated with the Whirlpool circuit board is a video about wired ethernet. Huh? Yeah, something went weird at YouTube. I think it should be fine now. just putting this out there it could also be compressor start kit . but get from a local repairman just ask for the 3 in one. they wont sell it inline that way. they want you to buy all 3 and pay $40 for each making it $120 total. This is an great site, I will definitely be sure to add this site to my morning routine. Very helpful … Thanks guys! Ok-we did all this. And it still won’t work. It was diagnosed by an appliance repairman, plus we can plainly see the burnt part on the circuit board. Any other ideas? If the board is replaced and the new board has a burnt circuit on it then the new board is defective. The old board had the burnt spot on it. The new circuit board appears fine., just didn’t fix the problem. My whirlpool side by side is not getting cold on the refrigerator side, how can this problem be fixed? Thanks in advance. Try repair clinic for replacement board. Just put your fridge model number in the parts search box on our site and you should get some options. I have the whirlpool Gold series model GD5PHAXMS10 and the control board is not beside the compressor a the back. I saw a parts manual online listing the main control board inside the control box. I tried to access it but I was having a hard time. Can anyone help please. Archie – As you know, we are not appliance repair guys. I too saw the same diagram online that you probably saw. I would try to figure out disassembly from that picture and go from there. Hopefully your issue is the same as mine and the control board fixes it. This board W10135090 is only available by rebuild. Fix Your Board will repair this board and give you a 2 yr wrty on it. Check out their website. Fast turnaround as well. Saving a few bucks might be worth it for some people. These boards are not cheap but they are cheaper than an entire new fridge! I have a Whirlpool and is only 3 yrs old. We have changed the circuit board, capacitor and the fan. The fan still does not run and the fridge will run for a few minutes and then shut off again. Can’t seem to find what is wrong. I live so far out that the repair man wants a 100.00 bill just to drive out plus parts and labor! Ugh. I don’t see anymore Whirlpool appliances in my future. That stinks. Sorry. Maybe try a different repair man or maybe replace the fridge. Hi, I’m new to your site. I found a YouTube video from you guys that is about the whirl pool gold side by side refrigerator. It was with a flickering light. THIS IS MY PROBLEM! Along with it not cooling properly. Here is the video: http://www.youtube.com/watch?v=9Z3h_AGUqwk&sns=em. Please give me website where I can order the main circuit board that is mentioned in the video? I am not sure if the replacement part is (The Original Part Number) 2304056, or The replacement Part Numbers W10135090 or AP4334000? What part number should i replace the main circuit board with, what website can I get a good one? and what can expect the cost to be? Enter your model number in search below (just below this post or on the right sidebar on this site) and then scroll through the list of parts until you find it. I have a whirlpool gold that was stored and running in my garage , some bugs got in the display (small moths) above the dispensers. How do you remove the display covet to remove these bugs! Thanks Guys, BUT when I replaced the main board, the problem still there (The Refrigerator works for short time and stops same its condition before I replaced the main board). Hello, I need to know a component that has been burned in the control board, refrigerator Whirlpool ARC 8140 / IX; This together with the blue PTC relays, think it is a triac or thyristor but can not see initials or letters of the component. No idea – we suggest replacing the component and not trying to fix the board itself. Thanks guys, you nailed it! Like a few others, I Googled my way to your site and you were clear and practical in your assessment. Your demonstration was spot on and you’re right – cleaning the dust bunnies took longer than replacing the part! The price from Sears was quoted @ $195 (June 2015), but I’ll look for a cheaper price online. Readers – ^^ that link may not be the correct part for YOUR fridge. To be sure, use the parts search on this site, put in your model number. I actually ordered this part twice. The first time the order was simply cancelled after a few weeks. I ordered it again and it was cancelled as well. Turns out Sears (Sears Parts Direct) doesn’t make/stock this part any longer. I’m looking around for a company that sells one, but so far I haven’t had any luck. If anyone out there finds one – let me know – I’m moving next year and I don’t want to buy a new fridge. Try the parts search on our website or call repair clinic directly. Is it possible to get schematic or circuit diagram for this board? Mine is also not working and I want to do board/circuit level analyses/repair. But can not find enough information on the net. i saw one posted elsewhere but it was slightly different than mine. I think the layout changed a bit from year to year. If you remove the board and inspect it closely you can see the fault(s). How to fix a board is beyond the scope of any advice I’m prepared to give. Look for posting #65 – it’s quite detailed. Thanks for the information, I too have a Whirlpool Gold, Talk to Whirlpool and they were no help.. This Part now is $449.00 because there are none only from a mother board rebuild service.. good luck to all of you with your Whirlpool. The board in my Whirlpool side by side was in a slightly different place – behind a thin steel panel on the lower back of the fridge. While stupidly prying the panel off with a screwdriver, a spark came out. The refrigerator is no longer cooling. Do I call a repairman or replace the 3 year old fridge? Note to others – unplug anything before taking a screwdriver to it! James – If you can identify the burnt out part maybe try replacing it. Search the parts search here. Thanks for the video guys. Very easy to follow instructions. 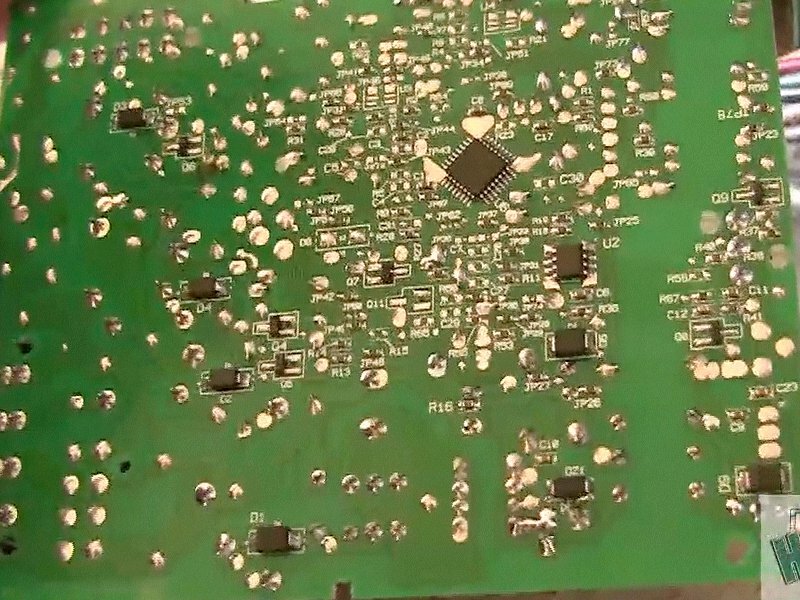 Whirlpool doesn’t even offer my control board anymore…so am having to have my old board repaired. Wish companies would make things to last and have parts available for at least 20 years… I guess I’m just too old school. Thanks for the video. However I have called everywhere and it appears there has been a 9 month back order on these boards and no place can give me a date when this might come in. How can Whirlpool not have boards to sell to people. This is bull. Hi. Wondering if someone could help me. Had a problem with the lights and cooling so had my control board repaired and just put it back following these instructions here. Now the lights work, but the compressor won’t come on at all. What could be the problem now? Could be the board again or a connector to the board. Hello, the control board on my Amana fridge used to fry, over an over, every 6 months or so. I’ve heard from the technician about voltage spikes and how it affects all electronic componants. Been 8 months now and the fridge runs smooth. Even had a few power outage and the board didn’t flinch. That little gizmo really does the trick. I pluged it in the outlet and it’s ready to go. Each repair on my fridge cost about 315$ so it’s really worth the 13$ I paid for. First only lights in refrigerator side wouldn’t work, but display’s were good–tried testing socket in fridge; spark; and now no displays, no lights, no water/ice maker, and no more sensor for ice maker… tried replacing display board, bo change; if I hold (cooling on/off) will cycle through and display will show #’s, still cools, but no display inside or out / nor lights… did I fry board in back/lower near compressor?